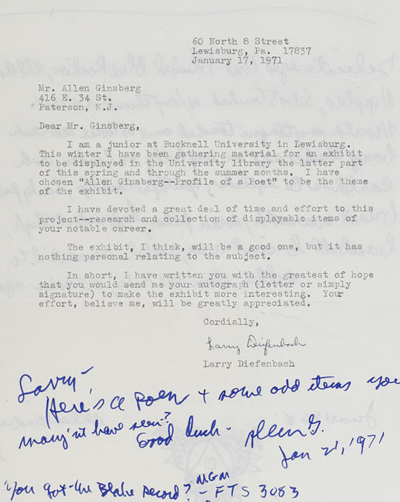 On January 17, 1971, a college student in Pennsylvania wrote a letter seeking assistance from Beat poet Allen Ginsberg. I am a junior at Bucknell University at Lewisberg. This winter I have been gathering material for an exhibit to be displayed in the University library the latter part of this spring and through the summer months. I have chosen 'Allen Ginsberg -- Profile of a Poet' to be the theme. I have devoted a great deal of time and effort to this project -- research and collection of displayable items of your notable career. The exhibit, I think, will be a good one, but it has nothing personal relating to the subject. In short, I have written you with the greatest of hope that you would send me your autograph (letter or simply signature) to make the exhibit more interesting. Your effort, believe me, will be greatly appreciated. Ginsberg immediately replied upon receipt of the letter on January 21st, returning it with his holographic response. Here's a poem + some odd items you may'nt have seen? 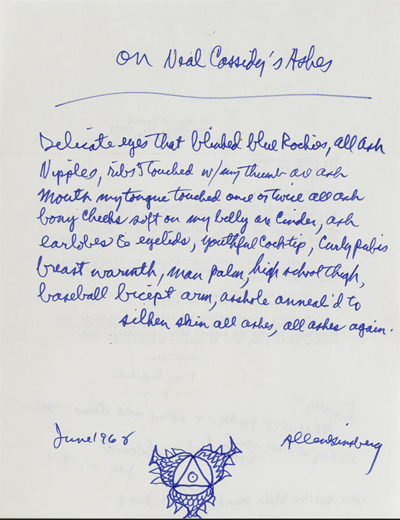 Ginsberg dates the poem's creation June 1968, signs it, and includes his hand-drawn Buddha's footprint logo. Neal Cassady, Beat Generation muse and the vivid model for wild man Dean Moriarty in Kerouac's On the Road and Ginsberg's on-and-off lover for twenty years, died in San Miguel de Allende, Guanajuato, Mexico on February 4, 1968. His body was found by the railroad tracks just outside of town; he had passed-out after walking the tracks on a cold and rainy night after attending a wedding party and was discovered in a coma. He died a few hours later, just shy of his 42d birthday after a lifetime of terminal velocity in the pursuit of heightened existence. Cassady was cremated and the disposition of his remains became contentious, with his wife, Carolyn, fending off two women who laid claim to his heart while he was alive, and post-mortem. 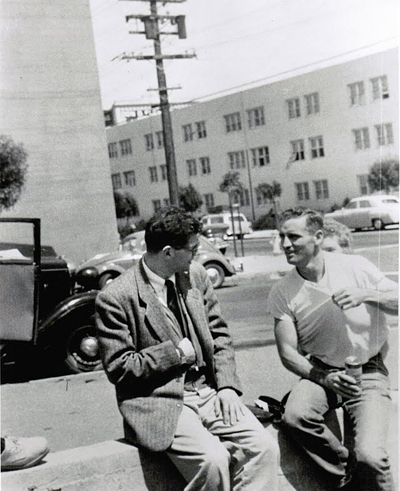 Allen Ginsberg and Neal Cassady, used car lot, San Francisco, 1955. His "ashes were the subject of squabbles, first between Carolyn and 'a wild-looking hippie girl' and then with Diana Hansen, to whom Neal had got hitched in 1950, while still married to Carolyn. She called repeatedly, requesting a portion. Carolyn resisted at first, but then 'sent Diana some ashes, with love'” (NY Times, Nov 19, 2006). "in 1968, I went down from San Francisco to visit Carolyn Cassady in Los Gatos. There's a poem of mine called 'On Neal's Ashes' which is a record of that visit, of opening the wooden container from Mexico City which had a silken bag full of his ashes. I opened the box and touched my finger inside of it and then looked in it and there was all this black and white cinder with a little rough stuff in it, pieces of bone that were burnt and blackened. So I said, 'Oh, so that's what happened to Neal Cassady.' It seemed magical that he'd disappeared and transformed into this tiny pound of gritty ashes. But it was definitive as his death. I realized it had all come to that. I hadn't seen him for a number of years and his disappearance was no big deal until I actually saw the remains of his body" (A Valentine for William Blake, Introduction to an unpublished manuscript of Ginsberg's Blake lectures). This letter is being offered at Bonham's-San Francisco in their Fine Books & Manuscripts sale on February 17, 2013. It is estimated to sell for $800-$1200. Ginsberg can be heard reciting On Neal's Ashes on Holy Soul Jelly Roll Vol. 4: Ashes & Blues. Letter images courtesy of Bonham's, with our thanks. a kind good-bye ... farewell.